The sweater is super cool, but I think these Leg Warmers steal the show! It’s so lovely! I adore this chic and very wearable design. 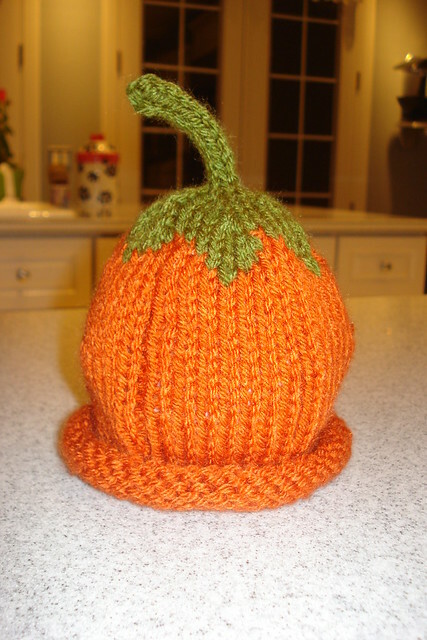 This Moebius is knit flat and then given a half-twist before the two ends are joined. This method makes the twist lay flat, instead of having a bulky full-twist in the front. This attention to detail demonstrates Marilyn Losee’s talent as a designer. Love it! Posted by Katie in Who Knit It Better? I would like to start a new series for this blog called: Who Knit it Better? There are a lot of really similar patterns out there and I thought it would be fun to bring them all to one place so knitters can see, compare them, and decide which pattern is their favorite. I am not trying to collect votes, I just think it would be nice to see all the variations in one place. 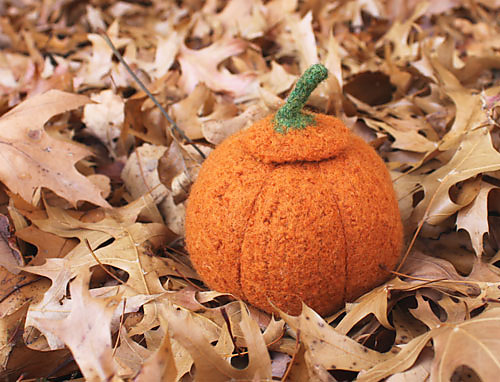 Please Note: This is a POSITIVE forum for knitters. So. Here goes. It’s up to you: Who Knit It Better? 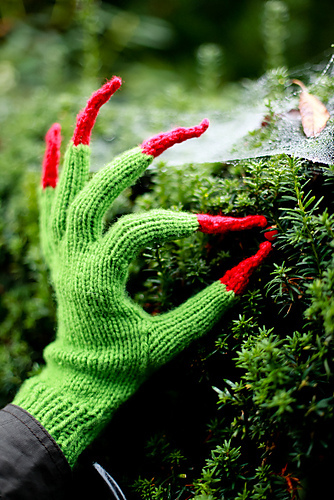 These gloves made me shiver because they’re so spooky! I seriously love this design. It’s simple yet chic. 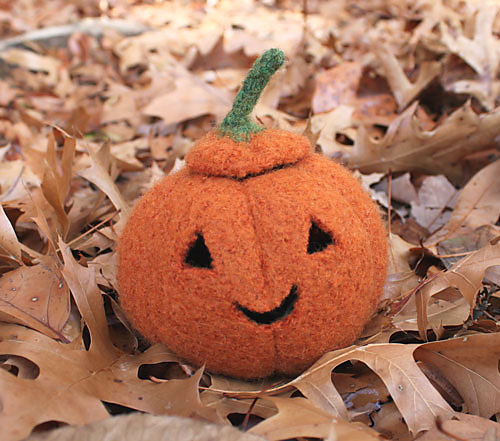 It’s the perfect little something to make any fall wardrobe pop. Every Knitter, at one time or another, will come across a pattern that absolutely takes their breath away. You’ll see it and then you will just know that it must be yours. You want to cast it on immediately and you know that it will be A-MAZ-ING when you are done. There’s just one problem. The pattern is not in English and a translation cannot be found anywhere. This is Coeurs et Flocons by La Droguerie (roughly translated, it’s called Hearts and Snowflakes). 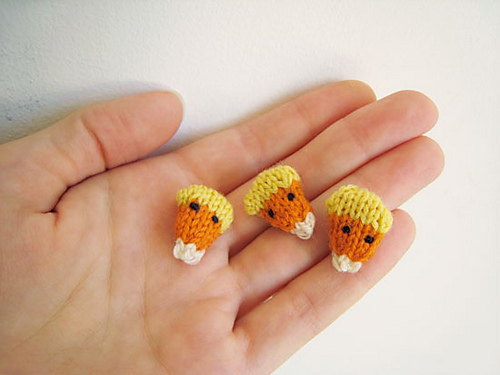 It’s a pattern that I will dream about for years to come, but I will never be able to knit. I cannot read French knitting patterns and I can’t even imagine how French Knitting Language most likely differs a great deal from American knitting. Do you have a Pattern That Got Away? Feel free to share in the comments. I got to work early one day last week and decided a little crafting would help the time pass. 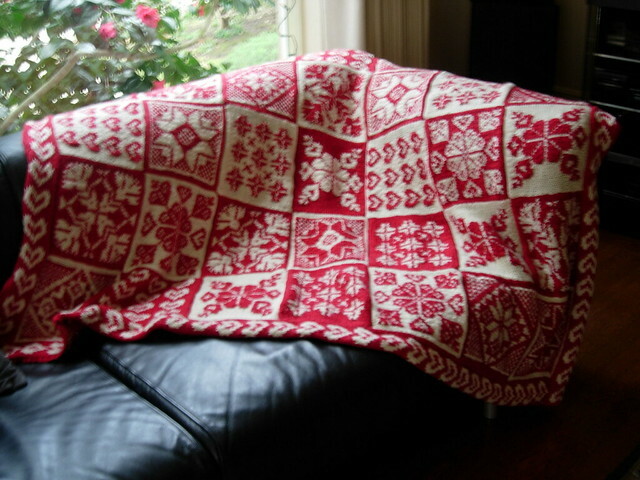 I sat down, whipped out my knitting, and started clicking away at this afghan I’m working on. I sat in our office and some of my coworkers would occasionally pop their heads in and ask what I’m knitting or comment about how they want me to knit something for them. All pretty typical comments whenever I knit in public. About 5 minutes before I was supposed to clock in, I finished up my row, packed everything up, and went about my work day. About 2 hours later, I ran into a coworker in our office (let’s call her Sally) and we’re chatting about work stuff, and suddenly she says, “Oh, you lost your needle. I found it on the floor and I put it right here.” She points at the counter. I am shocked. How did I loose a needle? I am very careful to pack everything up when I am done knitting. As I make my way over to the counter, I am thinking about what a nice coworker I have. She’s so great for taking the time to rescue my needle. I start to quiz Sally. I ask her what the needle looked like. She says it’s a silver needle with a rounded tip. I laugh, because this describes many of my knitting needles. I ask her how big it is and she holds her hands up about 2 inches apart. I realize we are now searching for a tapestry needle and I start to panic. Tapestry needles are a special nemesis of mine. I MUST own at least 30 tapestry needles, but the most I can ever locate at any time is one tapestry needle. Whenever I lose that one needle the search for it reduces me to pathetic tears and delusions that maybe the knitting store is open past midnight. Sally knows none of this, but I can tell she is starting to get the sense that THIS IS BAD. And then it happened. I got down on my hands and knees in the middle of my office and started frantically combing the carpet for my missing needle. At this point, most of my coworkers are looking at me as if I am a mental patient, but I don’t care. I just keep searching. Ten minutes of searching yields no needle and only the shreds of what is left of my dignity. I am defeated. I trudged out of the office and continued my work. This was, I should mention, a particularly difficult work day because virtually every customer we had contact with that day was angry. I spent 4 hours getting yelled at, and another 3 hours cleaning up and helping another manager close out the day. As we are writing our final report for the day, drowning our sorrows in Aqua Panna, I am sitting on the floor and I start to wonder again where the heck that needle went. I manage to keep my composure and NOT embark on a second search while we sit there. After we finish our report, we start to stand up, and suddenly, I spot my rogue needle. I had actually just been sitting on it (see how the needle mocks me???). I grabbed it off the ground, raised it in the air, and started yelling in victory. This has probably confirmed any suspicions that I am a crazy knitter, but I don’t care. I won. Boo-yeah needle. Victory is mine. 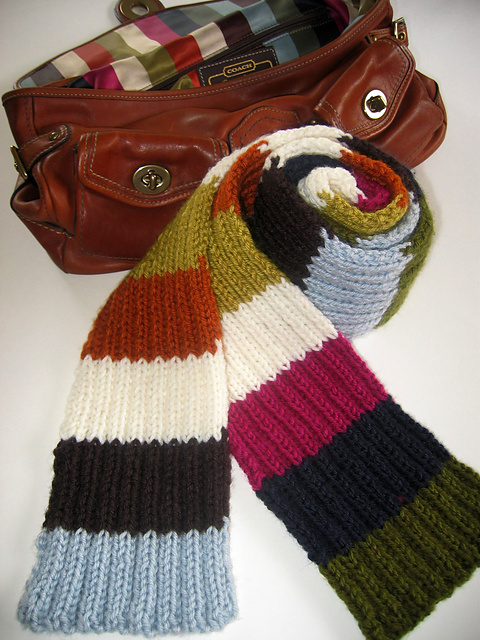 Jeanna’s blog has a couple other scarf patterns (all fabulous) and they’re all reversible. You should check her out!